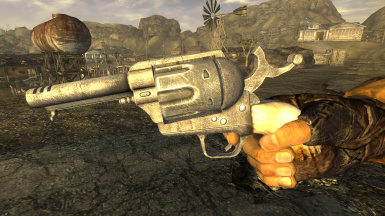 This mod adds a faster-firing .357 Revolver to the game, with a custom mesh. 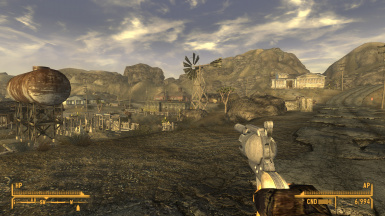 This gun is a Single Action Army-style revolver that's been extensively modified for speed shooting, featuring ported compensator cuts on the shortened barrel to reduce muzzle climb, and a higher-curving speed hammer for faster fanning. It may look vaguely familiar to anyone who's ever seen The Expendables, as Sylvester Stallone's character uses a similar one to great effect in the climax of that movie. I started with the base game .357 Revolver mesh and removed the front sight before shortening the barrel, ejector rod, cylinder pin and grip. Then I added the compensator cuts and speed hammer. 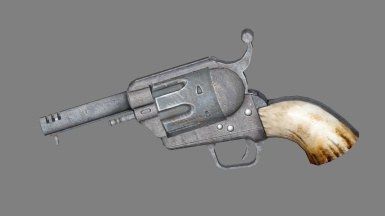 Gameplay-wise, this weapon is more or less identical to the .357 Revolver, but with a halved bullet spread and a much faster firing rate (almost three times faster!). It can't be modded and doesn't have iron sights, so you have to shoot from the hip. It also counts as a holdout weapon, so you can sneak it into casinos. 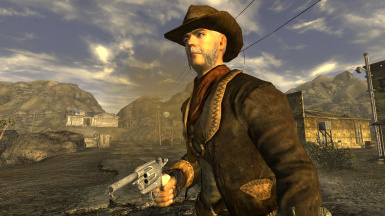 I've added the weapon to all the appropriate form lists, so that all perks and challenges that affect revolvers will work as expected.